Outside, winter is at its height. The leaves have gone from the trees, the east Devon skies are darkening, the light low. Inside a neat home, tucked away from the bustle of daily life, a piece of exquisite lace is slowly being created. Pat Perryman’s nimble fingers move silently across the curved surface of a blue-clad pillow, weaving bobbins and cotton thread around an array of silver pins. Fraction by fraction, a picture emerges, following the pattern on a card beneath the pins. For hour after patient hour, Pat works towards her finished creation. Eventually, several hundred hours after she started, the work is done, and a new piece of historic Honiton lace is born. For Pat, making this complex but beautiful piece of lace is a therapeutic labour of love. “If life is stressful, I can sit and do lace and be in another world,” she says. It is something she has been doing for nearly half a century now. Today, she is a seasoned expert, known around the world. A trained dressmaker, Pat came to lacemaking by chance. In 1969 she joined a class at the local community college. The mother of two young children, it gave her the opportunity to do something away from the house. In the years since then, she has created a prodigious quantity of work. It ranges from tiny, delicate pieces enclosed in pendants to larger work displayed in frames. The majority of her creations are decorative, although some have practical application. A lace parasol, adorned with 24 different butterflies, is redolent of a more feminine age. A sumptuous lace garter made for the wedding of her granddaughter-in-law took 80 hours of dextrous work. To make a wedding veil could take several years. “If you have a five-year-old daughter, you had better start now,” she says. In 1980 she was asked to make a new Honiton lace jabot, or ornamental neck frill, for the then Speaker of the House of Commons, George Thomas. The pattern was designed by Honiton School’s art teacher, Tom Griffiths. It depicted a portcullis and crown, the flower emblems of the UK’s four countries, plus images inspired by the Devon landscape. It took Pat many hundreds of hours to make, over three years. By the time it was finished, a new Speaker, Bernard Weatherill, was in office. He came to Honiton in 1984 to be presented with the jabot. Later that year Pat was invited to the State Opening of Parliament, at which the Speaker wore her unique creation for the first time. At the subsequent reception she was asked to make a pair of matching cuffs. That resulted in a further thousand hours of work over four years. Her biggest single project is safely contained in a quilted box. 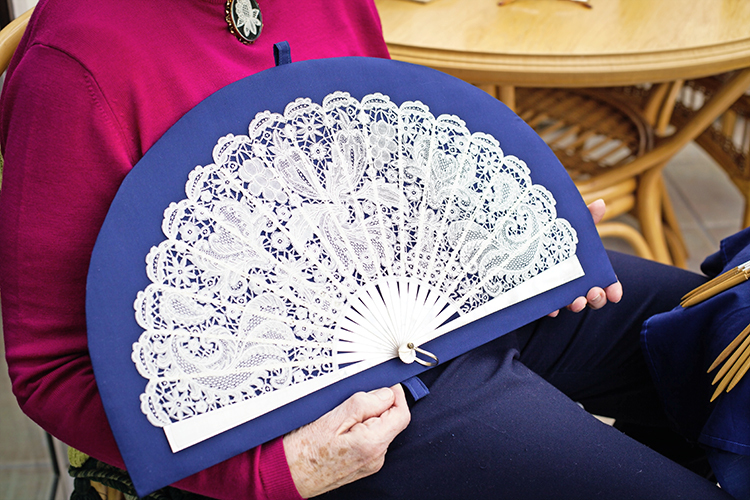 This is an exquisitely beautiful fan, consisting of 11 separate pieces of lace. “I always wanted to make a fan, and I was working on this for about three years,” she says. “I had all sorts of ideas for its design, but was eventually inspired by a piece of lace we have here in Honiton, in Allhallows Museum, called the Treadwin Flounce. She has presented her own work to royalty. When Princess Anne visited Honiton in 2005, Pat gave her a piece of lace with an intricate swan design. It had taken her approximately 350 hours to complete. She also gave the Princess a brooch depicting a lace horseshoe with the initial ‘A’ woven in it. In 2013 Pat achieved the jewel in the crown of her career. She was awarded the British Empire Medal for Services to the Heritage of Lace-Making in the Queen’s Birthday Honours list. Today, she continues to teach lacemaking classes. She has also had two books published. One is her New Designs in Honiton Lace, created in collaboration with a lacemaking colleague, Cynthia Voysey. The other is Pat Perryman’s Lace Patterns. Both remain in demand. For almost half a century Pat has inspired many people to take up the threads. She is delighted that the craft is continuing to thrive. “We still have a class on a Saturday morning for children. It is now taught by one of my former child pupils, and it’s rewarding to see the tradition carried on.” Her enthusiasm for the lace is infectious. For her, it is a task of unstinting dedication to creating works of delicate art that will last for centuries. The design is traced onto tracing paper. Pat then follows this first tracing, putting dots on a second piece around the outline of the design. This second tracing is placed on a piece of oiled Manilla card, a strong card treated with linseed oil. The dots she has made are pierced with a needle, marking the pattern on the card. Pins are placed in the holes on the card, which sits on a lacemaker’s pillow. Pat has already wound fine, white, two-ply thread on the ends of the bobbins, slim pieces of turned wood. She is now ready to start a process she describes as weaving the thread with pairs of bobbins round the silver-coloured pins. Each picture is constructed in sections. These vary in size depending on the image that the finished piece depicts. They may be small, just a flower face, or bigger, as with Pat’s fan, which comprises 11 sections in total. The outlines of the design are created first before the central area is filled in with a criss-cross lacework. This filling is called leadwork, which Pat believes is named after the leaded lights of windows. When a section is finished, the pins are removed and the lace taken off the card. The finished piece will be the same size as the pattern on the card beneath it. Finally, the different sections are joined to create the finished picture, with the same thread that was used to make the lace.